Cleaner washing for the Travelling Awesomes! In case you are new here, and don’t know us very well, Momma Carlton (me) is quite the label reader. And I’m not just talking food labels. Anything that has a label is read before we buy it. One thing that has recently decided to join the healthy body/soul movement here in our mansion on wheels is body wash. Think about it for a second….we eat organic fruits and vegetables, grass fed beef and free range chicken. We don’t eat processed foods or high fructose corn syrup and msg. We eat sweets sparingly and keep sugar to a minimum. And in all honesty that is really quite good for us. But something I’ve overlooked, slightly on purpose, are the things we put ON our bodies. Soap, shampoo, lotion. Those things that are absorbed by our skin. Did you know that if you put a garlic clove between your toes you’ll taste it after about five minutes? Seriously, you should go try it! By the end of the post you’ll have garlic breath! Anyway, my point is our skin breathes. Things can get out via our pores…what makes us so purposefully ignorant of the fact that things can get IN too? I know, I know….I love frou frou smell goods just as much as the next person. But who actually sets the limits for what’s healthy in our soaps and lotions? If you said no one did, then you’d be right. There is no government agency that regulates or requires the use of pre-market testing or health studies on any cosmetic item before marketing. Did you read that right? Let me rephrase. The FDA does NOT have to approve any material used as a cosmetic ingredient before marketing. Huh?! Are you serious? We live in a society that is chock full of people who are uber conscious of the food they eat….and yet the beauty enhancing products that they lather all over their faces and bodies on a daily basis contains ingredients like lead. Are you concerned yet? Did you also know that 1/3 of the cosmetic products on the market (shampoo, lipstick, cleanser, lotions, foundations etc…) contain one or more ingredients that are possible human carcinogens? I could seriously go on and on listing all the findings and throwing out numbers and percentages guaranteed to scare your pants off. But, really, if you care at all, you’ll do some research and find out for yourself. I’ll even make it easier for you….click here for a website to read. If you want to find some cosmetics that won’t kill you then try Afterglow Cosmetics. They are from Raleigh, my last permanent home, and are recommended by my good friend and chiropractor Puja Wentworth of The Chiropractic Wellness Studio. How does that information tie into the purpose of my blog topic today? I want to show you just how easy it is to replace that pump bottle of toxicity that you use to wash your hands multiple times a day. At least I hope you wash your hands….if you don’t, well then, I don’t think you’ll get much out of this post! If you are like me, you cringe at the thought of buying hand soap. There are two basic choices when looking at the rows and rows of options at the store. Pricey or unhealthy. At this point in my life I choose pricey. However, with three kids and a manic momma who polices the sink after touching just about anything since the last washing, we can go through some hand soap. My current favorites are Mrs. Meyer’s Clean Day products. I really like the Basil hand soap. What I don’t like is the price. I can pay upwards of $6 for a bottle. Yeah….I know. I’ve got to get a new soap….or do I? I decided to do a little experiment. However, since Mrs. Meyer’s bar soap is still $5 per bar (and I couldn’t find any and got impatient to do my experiment) I decided to use something else in its place. I decided to make hand soap from an existing bar of soap that I am ok with using. It actually was quite easy and saved me, in the long run, a bunch of money! Here are the ingredients and how much I paid for them. I know you’re thinking, ” this is $11 bucks and a bottle of your soap is $6. How is that saving money?” Well, let me tell you my friend, this batch makes a GALLON of liquid hand soap! Anyway…. The first thing I did was set about a half gallon of water to boil on the stove. Once it’s boiling, turn it down to simmer and then add in soap that you’ve either shredded or just cut up (like i did). Use the whole bar, it’s easier than storing it afterward! 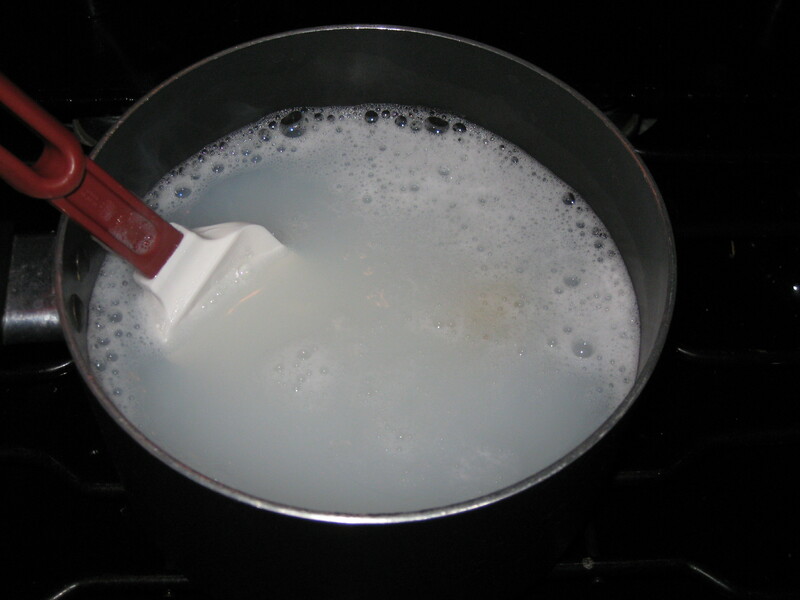 Once you add your soap to the water in the pot on the stove, stir occasionally and don’t let it boil. Just simmer it until the soap is all melted. It will come to look like soapy water. Then, you’ll want to add in the glycerin. 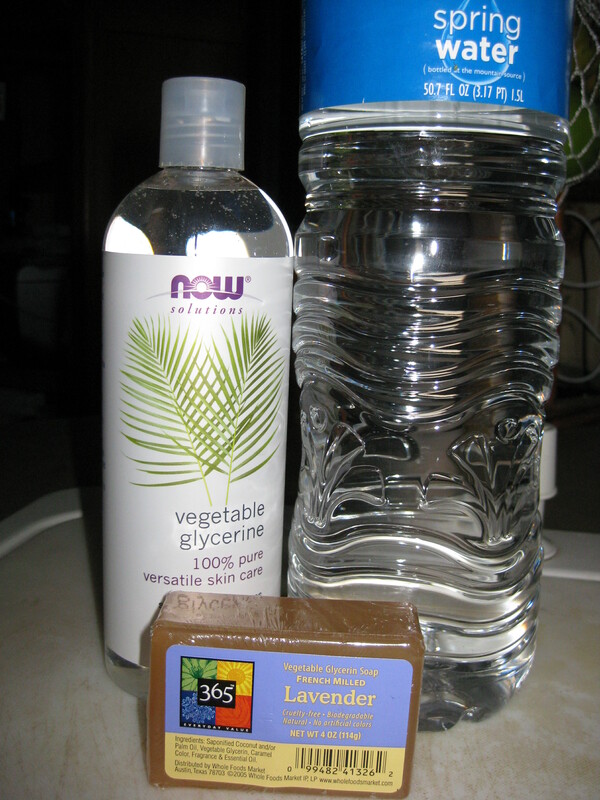 You don’t have to buy food grade glycerin, but since I never know what I’ll need for the next experiment that comes my way, I figured I’d get the kind that I can use for anything! I added about 1 1/2 TBS and it was too much. My soap ended up like jello. From what I understand, it’s all a guessing game depending on what ingredients that are already in your chosen bar of soap plus how thick or thin you want your soap to be. I think that I would have been fine with about a 1/2 TBS of glycerin. 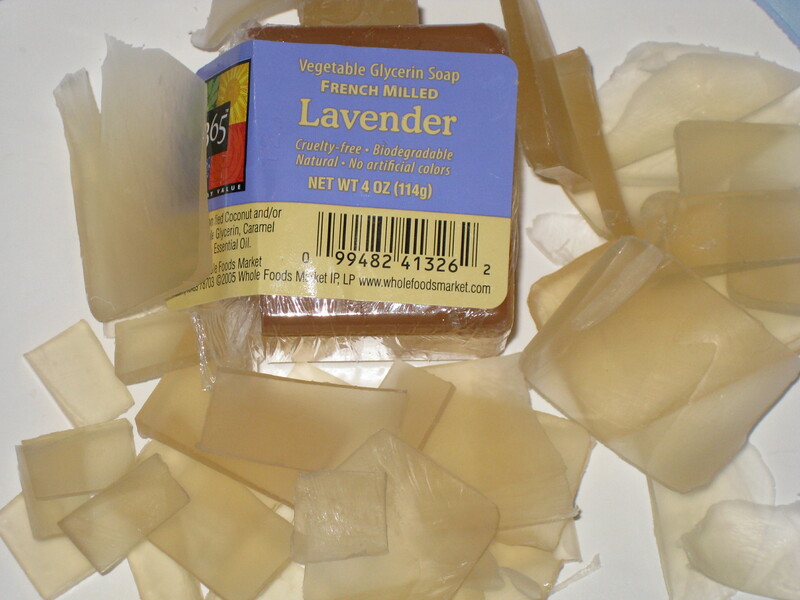 You can try none if your bar already has some in it because the soap can always be warmed up and added in later. Just so you know, glycerin is what thickens the soap. If your soap doesn’t have glycerin in it already I don’t think you would need more than 2 TBS. 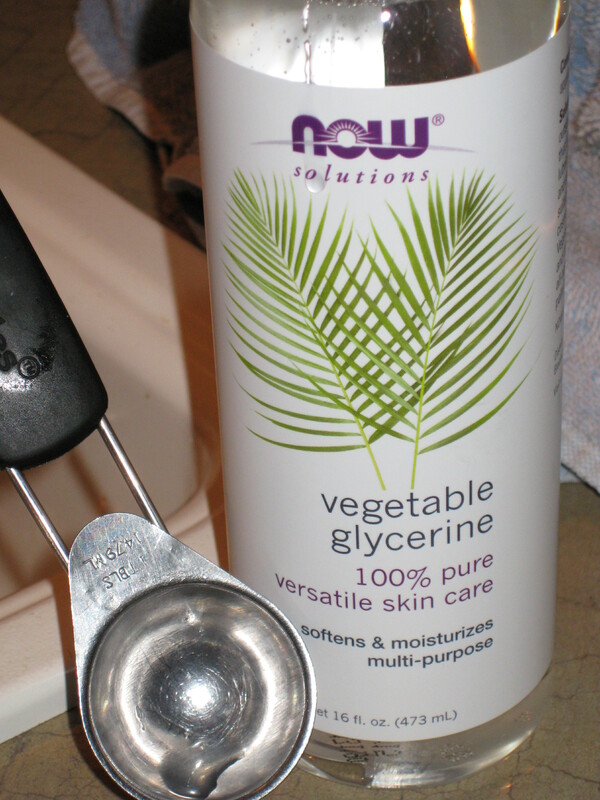 Thicker consistency = more glycerin. Thinner consistency = less glycerin. After you stir in the glycerin, you stir in the remaining water and then let it sit overnight, or about 12 hours. After an hour or two it will start to look cloudy and then become thicker as it sits and cools. Since I didn’t plan well enough and didn’t have a container to put my new hand soap in, I just poured it into baggies and put them in a drawer. Though, if I think about it, I’ll just grab a gallon jug of water and then use the jug for my soap container! All in all, I made 1 gallon of hand soap for about $3. If I would buy soap with good safe ingredients a gallon would cost in the neighborhood of $30. I’d say that this was definitely worth my 20 minutes of hard labor! The fun thing about this is that you can use any soap you like with any scent you like. You could even just order plain glycerin blocks and melt them with water and essential oils for very basic and clean soap. One concern was that there are no preservatives in them which makes the shelf life short. I’m ok with that. We go through soap fast enough that a gallon will be used before it could possibly go bad. But if you start making your own, be sure to check the ingredients you are using to make sure they stay safe for however long you’ll keep the product. 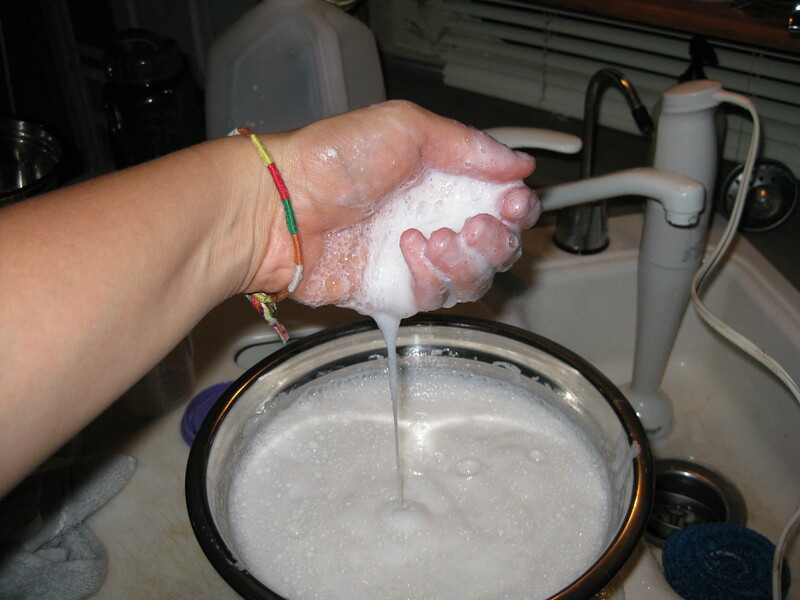 And one thing I’ve learned since using my own homemade laundry soap and now hand soap, suds do not equal cleaning power. It doesn’t have to suds up to make your body parts/laundry clean. I hope you enjoyed my rant and if you decide to try to make your own liquid hand soap, leave a comment and let me know how it goes for you! Previous PostN’Awlins EatsNext PostHelp us name the game!